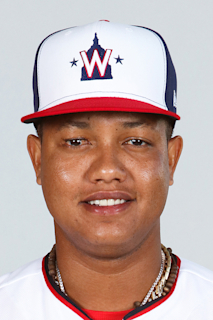 Starlin (STAR-lynn) de Jesús Castro...has two sons and a daughter...former Cubs' teammate Alfonso Soriano, is his son Starlin Jr.'s godfather. In first season with Miami, posted 165 hits, which ranked 14th in National League...Marked eighth-most hits as a second baseman in Club history...Reached base safely in first 11 games of season, tying Carlos Lee (2012) for sixth-longest on-base streak to open a Marlins' career... Recorded 500th career RBI on April 2 vs. Boston...Had 16-game hitting streak at Marlins Park snapped on April 11, tying Christian Yelich for longest hitting streak in venue history. Hit .357 (25x70) during streak, with five doubles, a triple, two home runs, and 13 RBI...Hit 100th career home run on May 5 at Cincinnati...Tied for team lead with eight game-winning RBI...Had 25 infield hits, tied for fourth-most in National League, and tied for ninth in MLB...Finished second among NL second basemen in hits, behind Scooter Gennett (178); his average (.280) ranked second among NL second basemen, behind Gennett (.314)...Led Marlins with 47 multi-hit games, which ranked tied for 12th in National League. In second season with Yankees, hit .300 (133x443) with 66 runs scored, 18 doubles, 16 home runs and 63 RBI in 112 games... Posted .323 average (70x217) with 10 home runs in 57 games at Yankee Stadium, compared to a .279 (63x226) mark with six home runs in 55 road games... In 18 games against Baltimore, scored 18 runs and drove in 17. Homered in four straight games from June 9-Sept. 4, matching Yankees' longest consecutive home run game streak against the O's since moving to Baltimore in 1954: Yogi Berra homered in four straight from May 20-22, 1955... Homered five times in April, and again in June, marking highest career home run totals in those two months... Recorded at-least one hit in 24 of team's first 28 games (through May 6), becoming first Yankee to do so since Derek Jeter (24) and Alex Rodriguez (24) in 2007. Totaled 43 hits through those 28 games, marking second-most by a Yankee through 28 games since 2004, behind Jeter's 48 in 2012. .. Hit game-tying two-run home run with one out in ninth inning in April 28 win vs. Baltimore. Marked sixth career game-tying or go-ahead home run in the seventh inning or later... Collected two-or-more hits in five consecutive games from May 1-6, one shy of career-long six-game streak from Aug. 29-Sept. 4, 2010... Homered in three straight games for first time in career from June 9-11... Made first career start as designated hitter on June 17 at Oakland, going 1x4... Left June 26 win at White Sox in bottom of third after suffering a right hamstring strain... Placed on 10-day disabled list from June 27-July 14, missing 13 games. In two rehab starts with Double-A Trenton, went 2x7... Earned fourth career All-Star nod (also 2011-12, '14) and first as a member of AL. Was first All-Star selection as a second baseman, as three previous were as shortstop. Did not participate due to injury... Returned to 10-day disabled list from July 23 (retroactive to July 22)-Aug. 25 with a right hamstring strain, missing 31 games. Made six rehab appearances at Triple-A Scranton/Wilkes-Barre, batting .333 (8x24) with four runs scored, one home run and two RBI... Went 4x4 with two runs scored, a double and one RBI in Aug. 27 win vs. Seattle, matching career high in hits (16th time, first since Sept. 15, 2016 at Boston). Hit .270 (156-for-577) with 63R, 29 doubles, 21HR and 70RBI in 151 games (143 starts at 2B, 3 at SS) in his first season with the Yankees…led the team in hits, multi-hit games (41) and games with at least 3H (12) and tied for the team lead in RBI (also Gregorius)…hit .310 (91-for-294) with 15HR in 78 games at Yankee Stadium compared to a .230 (65-for-283) mark with 6HR in 73 road games. In his first full season at 2B, made only 12 errors (all at 2B), the fewest errors in a season in his career…had a 35-game stretch without an error from 4/13-5/21. Set a single-season career high with 21HR and recorded his highest extra-base hit total (51, 29 doubles, 1 triple, 21HR) since 2012 (55)…became the fourth second baseman in Yankees history to hit 20HR in a season (Robinson Canó-5 times, Joe Gordon-4 times, Alfonso Soriano-twice). According to research performed by YES Network, Castro and Gregorius, both 26 years old, formed the Yankees' youngest regular starting middle infield pairing since 2B Willie Randolph and SS Bucky Dent began a three-year run in 1977, when Randolph was 22 and Dent was 25. With his 21HR and SS Didi Gregorius hitting 20HR, the duo became just the third 2B/SS combo, aged 26-or-younger, in Major League history to each hit at least 20HR, joining Houston's Jose Altuve and Carlos Correa in 2016 and Seattle's David Bell and Alex Rodríguez in 1999 (credit: YES Network). His 8RBI from 4/5-7 were most by any player in his first three games as a Yankee since RBI became an official stat in 1920 (previous: Bob Tillman, 6RBI in 1967; Todd Greene, 6RBI in 2001 and Wilson Betemit, 6RBI in 2007)…since 1920, became the third Yankee with as many as 8RBI in the team's first three games of a season, joining Babe Ruth (1932) and Bill Dickey (1934), who each had nine…his 7RBI through his first two games with the club were also a franchise record (previous: Todd Greene, 6RBI in 2001)…was the first Yankee with XBHs in each of the team's first three games of a season since 2011 (Mark Teixeira). Collected his first hit as a Yankee with a second-inning, two-run double off Dallas Keuchel in 4/5 Opening Day loss vs. Houston…according to Elias, became the first Yankees player to with at least 2RBI in his first PA for the team on Opening Day since Billy Martin in 1950…was his first Opening Day start at 2B (all others were at SS). Hit three-run HR-his first as a Yankee-and was 4-for-5 with 1 double and 5RBI in 4/6 win vs. Houston…tied his career high in hits and recorded his third career game with at least 5RBI (also 6RBI in his Major League debut on 5/7/10 vs. Cincinnati and 6RBI on 9/18/15 vs. St. Louis, both with Chicago-NL)…with Mark Teixeira collecting 4RBI in the game, the duo became the first pair of Yankees teammates to record at least 4RBI in the same game at home since Eduardo Núñez (4RBI) and Alfonso Soriano (6RBI) on 8/13/13 vs. Los Angeles-AL…Didi Gregorius had 3H, making him and Castro the first Yankees starting middle infield duo to each record at least 3H in the same game since Robinson Canó and Eduardo Núñez each had 3H on 8/18/13 at Boston Collected his 1,000th career hit with a fourth-inning single (off Nathan Karns) in 4/15 loss vs. Seattle…at 26 years, 22 days old at the time of the hit, became the seventh-youngest player to debut since 1966 to reach 1,000H behind Miguel Cabrera (25y, 142d on 9/7/08), Alex Rodríguez (25y, 282d on 5/5/01), Ken Griffey, Jr. (25y, 268d on 8/16/95), Roberto Alomar (25y, 189d on 8/13/93), Robin Yount (24y, 335d on 8/16/80) and César Cedeño (25y, 128d on 7/2/76-G1)-credit: Elias…came in his 900th career game, becoming the first Major Leaguer to reach 1,000 hits by his 900th game since Denard Span (game No. 871 on 9/5/14)…was originally credited with his 1,000th hit on a seventh-inning single (off Logan Kensing) in 4/9 win at Detroit, but following a scoring change on a play earlier in the game, that hit now represents the 999th of his career. Made his first start (and appearance) of the season at SS in 6/2 win at Detroit, going 1-for-4. Hit ninth-inning "walk-off" solo HR in 6/22 win vs. Colorado…was his sixth career "walk-off" hit (first as a Yankee) and first career "walk-off" HR. Had 39RBI in his final 63 games of the season (7/17-10/1)…totaled 6RBI over 32 games from 6/8-7/16. Hit 8HR with 24RBI in 28 games in August, setting new single-month career highs in both offensive categories…hit .313 (35-for-112) during the month, becoming the first Yankee to hit at least .300 with 8HR and 24RBI in a calendar month since Alex Rodríguez (.309, 9HR, 26RBI) in September 2010. Hit his first career grand slam and was 2-for-3 with 3R and 2BB in 8/5 win vs. Cleveland, making his first start at SS since 7/5…was just the second grand slam by a Yankees shortstop since 1983 (Jeter, 6/18/05 vs. Chicago-NL). Played in his 1,000th career game on 8/7 vs. Cleveland, becoming the youngest player (26 years, 137 days) to reach the milestone since Miguel Cabrera played his 1,000th game on 8/23/09 (26y, 127d)-credit: Elias. Established a single-season career high with his 15th home run in 8/17 loss vs. Toronto. Hit two solo HRs in 8/22 loss at Seattle, marking his fourth career multi-HR game and first since 9/18/15 vs. St. Louis w/ Chicago-NL…Gary Sánchez also homered in the game, becoming the first pair of Yankees teammates to each record multiple HRs in the same game since Robinson Canó and Curtis Granderson both hit 2HR on 10/3/12 vs. Boston. Collected four straight multi-hit games from 9/12-15 (11-for-17), his longest such stretch since 6/20-24/11 (also 4G) and tied for the second-longest stretch of his career. Was removed from 9/17 loss at Boston after injuring his right hamstring while running out a fifth-inning double…underwent an MRI that evening, revealing a Grade 1 right hamstring strain…missed seven games (9/18-25) with the injury. Hit .265 (145-for-547) with 52R, 23 doubles, 11HR and 69RBI in 151 games with the Cubs...ranked third on the team with 36 multi-hit games and had a team-leading 12 games with at least 3H...batted .294 (5-for-17) with 9RBI with the bases loaded...had 12 game-winning RBI, the third-highest total among Cubs players...Batted .281 (86-for-306) on the road, compared to a .245 (59-for-241) mark at Wrigley Field...Spent the majority of the season playing shortstop, posting a .963 fielding percentage (484TC/18E) in 109 games (104 starts)...spent the season's final two months primarily playing second base-his first Major League experience at the position-and recorded a .957 fielding percentage (138TC/6E) in 38 games (29 starts)...Hit .325 (27-for-83) in April, including a six-game hitting streak from 4/18-23, during which he hit .444 (12-for-27) with 1HR and 7RBI...Recorded three "walk-off" hits-an 11th-inning single on 4/18 vs. San Diego, a ninth-inning single on 6/13 vs. Cincinnati and an 11th-inning single on 6/14 vs. Cincinnati...became the first Cub to record "walk-off" RBI in consecutive team games since Hall of Famer Ron Santo in 1966...has seven career "walk-off" hits...Collected his 900th career hit on 6/2 at Miami...at 25 years, 70 days old, became the youngest player in franchise history to reach the mark, surpassing Ron Santo, who reached 900H at 25 years, 183 days old...Hit .295 (61-for-207) following the All-Star break...batted .247 (84-for-340) prior to the break...Made his first career appearance at 2B on 8/11 vs. Milwaukee...made his first career start at the position on 8/14 at Chicago-AL...Over his final 45G of the season (beginning on 8/13), batted .358 (48-for-134) with 12 doubles, 6HR and 23RBI...Led the NL with a .369 (31-for-84) batting average in September and October (min. 60PA)...ranked third in the NL with a 1.055 OPS in the season's final month, trailing only Washington's Bryce Harper (1.216) and Colorado's Nolan Arenado (1.067)...Tied his career highs with 2HR (third time) and 6RBI (second time) on 9/18 vs. St. Louis...Matched his career high with 4H on 9/30 at Cincinnati, going 4-for-5 with 3R, 1 double, 1HR and 2RBI...Made his postseason debut, batting .176 (6-for-34) with 2R, 1 double, 1HR and 2RBI in nine playoff games for the Cubs, appearing in the NL Wild Card Game vs. Pittsburgh, NLDS vs. St. Louis and NLCS vs. New York-NL...Hit his first career postseason home run (solo) in the Cubs' NLDS Game 3 win vs. St. Louis, as the Cubs set a Major League record with 6HR in a single postseason game...Was acquired by the Yankees from the Chicago Cubs on 12/8/15 in exchange for RHP Adam Warren and a player to be named later (INF Brendan Ryan). Starlin earned his third-career National League All-Star nod (also 2011 and 2012) and went on to bat .292 (154-for-528) with 33 doubles, one triple, a career-high tying 14 home runs and 65 RBI in 134 games ...His season was cut short after suffering a sprained left ankle, September 2 vs. Milwaukee...Had 15 three-hit games, tied for sixth-most in the N.L...Batted .304 (35-for-115) with one home run off left-handed pitching ...Hit .288 (119-for-413) with 13 homers off righthanders...Moved to the No. 4 spot in the batting order, April 25, and went on to hit .287 (118-for-411) with 28 doubles, 10 homers and a .433 slugging mark in 103 games from the four-hole...Became the first Cubs shortstop with at least 10 starts at the cleanup spot in the batting order since Ernie Banks in 1961...Recorded his first two career multi-homer games, April 8 vs. Pittsburgh and April 27 in Milwaukee...Became the first Cubs shortstop with two multi-homer games in the same month since Ernie Banks in May of 1961...Was the first Cubs shortstop with at least two multi-homer efforts in the same season since Shawon Dunston in 1990...Belted his fifth homer in his 33rd game of the season, May 8 at the White Sox...Hit his fifth homer in 2013, July 9 vs. the Angels, in his 87th game played...Went a career-high 38-straight games without an error at shortstop from June 18-July 31 (148 total chances) ...Was the longest errorless stretch by a Cubs shortstop since Ryan Theriot had a 46-game run from April 28-July 25, 2007...Committed just four errors in his final 64 games (242 TC)...Enjoyed a torrid August in which he batted .378 (37-for-98) with a .408 on-base percentage, a .510 slugging mark and a .918 OPS...Tied his career-high with a 14-game hitting streak, August 1-15 ...Hit .421 (24- for-57) with seven runs, three doubles, one homer and seven RBI ...Posted a .967 OPS during the run...That hitting streak was part of a stretch in which he reached safely in 18-straight games, July 28-August 15, tied for the second-longest stretch of his career...Left the game, September 2 vs. Milwaukee, with a left ankle sprain suffered when sliding into home plate in the first inning ...Would miss the season's final 23 games. Starlin appeared in 161 games in his third full-season as the club's starting shortstop ... hit .245 (163-for-666) with 34 doubles, two triples, 10 home runs and 44 RBI ... set a career high, going 29-straight games without an error at shortstop from July 21-August 21... His day off, June 25, snapped a streak of 269-consecutive games played, as his previous off day was August 22, 2011 vs. Atlanta... The 269-game streak is the franchise's longest since Sammy Sosa played in 388-straight games from 1998-2000... Batted .251 (125-for-498) off right-handers and .226 (38-for-168) off southpaws, an anomaly considering his career .297 mark vs. lefties... Had four game-winning RBI and 10 go-ahead RBI ... had 17 two-out RBI... Led the team with 44 multi-hit efforts, second-most among N.L. shortstops ... Milwaukee's Jean Segura had 47... Finished the campaign with a .967 fielding percentage (22 E/676 TC) at shortstop ... committed just eight errors in his final 85 games from June 26 through the end of the season, and his .979 fielding percentage in that stretch ranked fourth among N.L. shortstops... Was 2-for-4 with a stolen base on Opening Day in Pittsburgh … first Cub with at least two hits and a steal on Opening Day since Corey Patterson did so Opening Day 2002 against Cincinnati... Set a single-season career high, and tied his career mark, with a 14-game hitting streak, April 6-22 … he batted .317 (20-for-63) during the run that matched his 14-gamer that overlapped the 2011 and 2012 campaigns... Hit a walk-off RBI double against Sergio Romo, April 13 vs. the Giants, giving Chicago a 4-3 win … hit his first homer of the season earlier in the game off Matt Cain... Collected the 100th double of his career, April 18 vs. Texas... After committing four errors in his first 16 games, had just one in his next 25 contests (102 TC), April 21-May 17... Batted leadoff for the first time on the season, May 10 in Washington … finished 2-for-5 with a pair of doubles, an RBI and a run scored... July 21 in Colorado, tied his career high with four hits ... finished 4-for-5 with a double and a run scored... Moved to the leadoff position in the batting order, August 21, and remained there the rest of the season, batting .260 (40-for-154) in 40 games. Starlin was named to the National League All-Star team for the second-straight season, and became the first player in franchise history to play at shortstop in all 162 games in a season ... he set career marks with 12 triples, 14 home runs, 78 RBI, 36 walks and 25 stolen bases in his second full major league campaign...Was the only player in the majors with at least 10 homers, 10 triples, 25 stolen bases and 75 RBI, and the first player to do so in the National League in five years (Philadelphia's Jimmy Rollins in 2007)....Is the first Cub since Sammy Sosa in 1995 to record at least 75 RBI and 25 stolen bases in the same season....Is the first Cubs infielder to appear in all 162 games in a season since Hall of Famer Ron Santo did so in 1968 ... the 162 games played at shortstop are a franchise record....His 161 starts at shortstop are a franchise record, surpassing the previous single-season mark of 158 starts at shortstop by Ivan DeJesus in 1978 and Don Kessinger in 1968....His 78 RBI led major league shortstops and were the most by a Cubs shortstop since Ernie Banks drove in 80 runs in 1961....His 12 triples made him one of just six Cubs in the last 50 years to reach that mark, and the first since Juan Pierre had 13 three-baggers in 2006....Led the club with 51 multi-hit games, tied for ninth-most in the N.L....Finished with a .964 fielding percentage (27 E/758 TC) at shortstop ... the 27 errors tied for the most in the majors with Pittsburgh's Pedro Alvarez....Tied his career high with two stolen bases on both April 7 and April 8 vs. Washington ... turned the trick a third time, April 28 in Philadelphia....Had two hits, April 8 vs. Washington, to extend his consecutive games reaching base safely streak to 43 contests dating to August 15, 2011 - that is the second-longest stretch by a Cub since 1918, surpassed only by Riggs Stephenson's 44-game streak in 1928....The two hits on April 8 also gave him a career-high 14-game hitting streak dating to September 17, 2011, surpassing a 13-game run, August 29-September 12, 2011....Both streaks would end, April 9 vs. Milwaukee, after an 0-for-5 night at the dish. ...His 10 stolen bases in April were the most by a Cub in the first month of the season since Brian McRae had 12 steals in 1996....Reached 500 career hits, September 7 in Pittsburgh, becoming only the 28th player in major league history to record his 500th career hit before turning 23-years-old, with the only other active player being New York's Alex Rodriguez....Reached the milestone at 22 years, 167 days, the youngest to accomplish the feat since Robin Yount in 1977 at the age of 21 years, 297 days. ...Twice tied his career high with four hits in a game: June 23 in Arizona and September 19 vs. Cincinnati....Batted .306 (64-for-209) in his final 54 games dating to August 8 ... had hit just .071 (2-for-28) in his previous seven games from July 31-August 7....Tied his career high with two doubles, October 2 vs. Houston. In his first full major league campaign, Starlin led the Senior Circuit, and was fourth in the majors, with 207 hits, and earnedN.L. All-Star honors...became the youngest All-Star in franchise history...he recorded five hitting streaks of 10 or moregames, the first Cub to do so since Hall of Famer Billy Williams in 1970...His 207 hits were fifth-most by a 21-year-old (or younger) in the 111years of modern major league history...Reached base safely in 40-straight games to close out the season,breaking the 82-year-old club mark for a shortstop...Cubs shortstopWoody English had owned the mark by reaching in 34-straight games in1929. Is the first Cub to reach safely in 40-straight games since JeromeWalton's 43-game streak in 1989...Batted .307 on the season, sixth-best in the N.L...Collected 57 multi-hit games, tied for the N.L. lead with Philadelphia'sHunter Pence, Los Angeles' Matt Kemp and New York's Jose Reyes...Led the Senior Circuit with 674 at-bats...his nine triples tied for fifthand his 291 total bases ranked ninth...Batted .342 (53-for-155) vs. lefties, fourth-best in the N.L....hit .309(107-for-346) on the road, sixth-best in the N.L...Became the first Cub with eight triples prior to the All-Star break sinceRyne Sandberg had 11 in 1984...Tied his career high with four hits four times: April 16 vs. Colorado, April23 vs. the Dodgers, May 11 vs. St. Louis and August 13 at Atlanta...Had a career-high 13-game hitting streak, August 29-September 12,batting .350 (21-for-60) during the run...also had three 11-gamehitting streaks and one 10-game hitting streak...Scored a run in 10-straight games, July 30-August 9...is the first Cubto turn the trick since Mark DeRosa scored in 10-straight games, May9-19, 2008...Committed 29 errors, second-most in the majors behind Baltimore'sMark Reynolds (31). Recorded a career-best 24-game errorless streak to begin thesecond half of the season, July 14-August 9...Began the year as the youngest player in the major leagues...Made his first career Opening Day start and went 3-for-5 with two runsscored vs. Pittsburgh, April 1...Batted leadoff for the second time in his career, April 3 vs. Pittsburgh,and went 3-for-4 with two triples, a run scored and a walk...previouslyhit leadoff August 8, 2010 vs. Cincinnati (0-for-4)...Named co-N.L. Player of the Week for the week ending April 3...First player under the age of 22 to amass 10 hits in a team's first fivegames since Adrian Beltre did so at 21 years of age for the Dodgers in2000...Became just the third Cub since 1919 to collect at least two doublesand two triples in the team's first five games: Ron Santo in 1964 (2 2B,2 3B) and Charlie Neal (3 2B, 2 3B)...Matched his career high with four hits, April 16 at Colorado, falling atriple shy of the cycle with a 4-for-5 effort that included a three-runhomer...Tied his career mark with four hits from the leadoff spot, April 23 vs. theDodgers - was 4-for-5 with two runs, a double and three RBI...Committed three errors in April 25's second inning vs. Colorado - wasthe first Cub to commit three miscues in an inning since Jaime Navarro,August 18, 1996 vs. Houston (third inning)...His 40 hits in April are second-most in Cubs history behind MarkGrace's 42 hits in April of 1996...Batted sixth, May 11 vs. St. Louis, and tied his career high with four hits...finished 4-for-4 with three runs, a triple and three RBI...June 14 vs. Milwaukee, delivered a walk-off single in the 10th inning offTim Dillard to give Chicago a 5-4 victory...Had a then career-high 11-game hitting streak (20-for-44/.455) fromJune 16-27...Homered four times in nine games, August 3-12, after going deep threetimes in his first 107 contests...Collected his 200th hit of the season, September 23 in St. Louis,recording a single off Chris Carpenter to lead off the game. Starlin began the year at Double-A Tennessee, but was promoted to Chicago, May 7, and became the Cubs everyday shortstop... he batted .300 (139-for-463) with 31 doubles, five triples, three homers and 41 RBI in 125 games for the big league club. ... Was third among N.L. rookies in doubles and tied for third in multi-hitgames (39) and triples ... was fourth with 139 hits and seventh with 189total bases. ... Batted .340 (81-for-238) at home, the fourth-best average in the N.L. ...his .339 average (43-for-127) against lefties was tied for fourth in theleague. ... His 39 multi-hit efforts were the most by a Cubs rookie since Mark Gracehad 41 in 1988. ... Became the first Cubs rookie to record six-straight multi-hit games(August 29-September 4) since Don Johnson in 1944. ... Collected 41 hits in August, the most for any Cubs rookie in any monthsince Ernie Banks had 43 hits in August of 1954. ... Had a .950 fielding percentage (27 E/544 TC) in 123 games at shortstop... his 27 errors were second-most among shortstops, behind fellowrookie Ian Desmond of Washington (34 E). ... Selected from Double-A Tennessee May 7, and that night in Cincinnatiwent 2-for-5 with a three-run homer in his first career plate appearance.w Added a three-run triple en route to a six-RBI game, the most RBIrecorded by a player in his first major league contest. ... At 20 years and 44 days, was the youngest Cub to make his majorleague debut since Oscar Gamble, August 27, 1969, at the age of 19years, 250 days.w Became the third-youngest player in big league history to hit ahomer in his first career at-bat, and the youngest in the last 60years ... he trailed only Whitey Lockman (18 years old in 1945)and Ted Tappe (19 years old in 1950).w Also became the youngest Cub ever to make his debut at shortstop,surpassing Marty Shay at 20 years, 144 days on September16, 1916. ... Started in 43-straight games after his promotion before coming off thebench, June 24 in Seattle. ... Batted .310 (27-for-87) in May, but batted .227 (17-for-75) in June. ... Doubled in four-straight games, June 27-30 -- the first Cub to do so sinceDerrek Lee (July 3-6, 2008). ... Drew a season-high three walks, July 3 against the Reds. ... July 15 vs. Philadelphia, recorded a straight-steal of home in the secondinning, becoming the first Cub with a straight-steal of home since BrianMcRae, April 13, 1996 at San Francisco. ... From July 10 through the end of the season, hit .325 (89-for-274) for thefourth-best average in the N.L. ... his 89 hits in that span were tied forsixth-most. ... Had a career-high eight-game hitting streak, July 20-28, batting .444(16-for-36) with five doubles, a homer and six RBI. ... Knocked in a run in five-straight games, July 20-25, becoming the firstCubs rookie to do so since Mike Fontenot, June 25-30, 2007. ... Batted .361 (35-for-97) in July after posting a .227 average in June. ... Collected a career-best four hits three times: August 4 vs. Milwaukee,August 12 in San Francisco and August 22 vs. Atlanta. ... Doubled twice in a game four times, last done August 30 againstPittsburgh. ... August 8 vs. Cincinnati, batted leadoff for the first time in his career,going 0-for-4. ... Batted .313 (5-for-16) in his final four games to finish his season with a.300 average. ... Began the year with Double-A Tennessee, hitting .376 (41-for-109) witheight doubles, five triples, one homer and 20 RBI in 26 games. ... Played in 16 games with Leones del Escogido in the Dominican WinterLeague. Starlin batted a combined .299 (140-for-469) with three homers and 49 RBI in 127 games between Single-A Daytona andDouble-A Tennessee...Went 4-for-4 with an inside-the-park home run to earn Florida StateLeague All-Star Game MVP honors...In 96 games with Daytona, went 108-for-358 (.302) with 45 runs, 17doubles and 35 RBI...Ranked third in batting average in the Florida State League...Hit .303 (83-for-274) against right-handed hurlers and .298 (25-for-84)against lefties with the D-Cubs...Boasted a .397 average (23-for-58) and a .909 OPS in the first inning... went 11-for-27 (.407) with a 1.152 OPS in the ninth frame...Owned a .324 average (61-for-188) in 49 away games with Daytona ...was 12-for-34 (.353) during the day...Batted .324 (95-for-293) from May 1 through the end of the season afterstarting the campaign with a .200 batting average (13-for-65) in April...Rode a season-high nine-game hitting streak, May 12-26, going 16-for-39 (.410) during the stretch...Named to the Florida State League Post-Season All-Star squad afterposting a .317 average (46-for-145) in the second half of the season...Was selected by the Smokies August 4, going 32-for-111 (.288) with 14RBI in 31 games...Boasted five-straight multi-hit affairs, August 20-24, batting .500 (11-for-22) during the run...Hit at a .346 clip (9-for-26) off southpaws with Tennessee...Batted .376 (38-for-101) with 10 RBI in 26 games for the Mesa SolarSox of the Arizona Fall League. Appeared in 51 games for Rookie-League Mesa, batting .311 (61-for-196) with 33 runs, 11 doubles, three homers and 22 RBI...Hit .331 (46-for-139) against right-handed pitchers compared to a .263 mark (15-for-57) against southpaws...Went 28-for-89 (.308) with 21 RBI with runners on base ... batted .327 (17-for-52) with 16 RBI with runners in scoring position. Batted .299 with 47 runs and 13 stolen bases in 60 games with the Cubs Dominican Summer League team. August 25, 2017 New York Yankees activated 2B Starlin Castro from the 10-day disabled list. August 18, 2017 New York Yankees sent 2B Starlin Castro on a rehab assignment to Scranton/Wilkes-Barre RailRiders. July 23, 2017 New York Yankees placed 2B Starlin Castro on the 10-day disabled list retroactive to July 22, 2017. Right hamstring strain. July 15, 2017 New York Yankees activated 2B Starlin Castro from the 10-day disabled list. July 13, 2017 New York Yankees sent 2B Starlin Castro on a rehab assignment to Trenton Thunder. June 27, 2017 New York Yankees placed 2B Starlin Castro on the 10-day disabled list. Right hamstring strain. June 22, 2017 SS Starlin Castro assigned to AZL Cubs. December 8, 2015 Chicago Cubs traded 2B Starlin Castro to New York Yankees for RHP Adam Warren and Player To Be Named Later. August 26, 2014 Chicago Cubs activated SS Starlin Castro from the bereavement list. August 21, 2014 Chicago Cubs placed SS Starlin Castro on the bereavement list. May 7, 2010 Chicago Cubs selected the contract of SS Starlin Castro from Tennessee Smokies. January 13, 2010 Chicago Cubs invited non-roster SS Starlin Castro to spring training. November 24, 2009 SS Starlin Castro assigned to Leones del Escogido. August 4, 2009 Starlin Castro assigned to Tennessee Smokies from Daytona Cubs. April 9, 2009 Starlin Castro assigned to Daytona Cubs from AZL Cubs.